Simon Newett, Extension Horticulturist.Department of Primary Industries and Fisheries, Maroochy Research Station, Mayers Road, Nambour 4560, Queensland, Australia. Previously published in: Talking Avocados (published by Avocados Australia Ltd), 11(2), 24-27. Foliar fertiliser application is sometimes promoted as an effective means of supplying nutrients to avocado. On the market are various products being promoted as foliar nutrients for avocado, some proponents even suggest that their products do away with the need for soil applied nutrients. This article briefly reviews the literature relating to foliar feeding of avocado and examines the anatomy of the avocado leaf and flower in relation to nutrient uptake. The structure of plant leaves has evolved primarily to capture sunlight and exchange gases, roots have evolved to absorb nutrients and water and anchor the plant. Any absorption of nutrients by leaves is therefore likely to be more fortuitous than by design. In some crops passive nutrient absorption by leaves is occasionally sufficient to supplement the supply of nutrients taken up by the roots. Most often this involves trace elements, which as their name suggests are required in very small amounts (eg. copper and zinc). However if non-mobile elements or elements with limited mobility in the plant (eg. calcium, phosphorus, zinc, boron and iron) are absorbed when foliar sprayed they are not likely to make it down to the roots where they are also needed. Most nutrients will move freely in the water stream but the movement of many is restricted in the phloem, hence leaf applications don't meet the requirements of deficient trees. Occasionally major elements (such as nitrogen and potassium) are applied to make up for a temporary shortfall or provide a boost at a critical time. Citrus is an example of a crop where some benefits from foliar applied nutrients have been reported. The ability of the leaf to absorb nutrients from its surface must depend to some degree on the permeability of its epidermis (outer layer) and the presence and density of stomates (pores for the exchange of gases). Scanning Electron Microscope studies of mature leaves and floral structures in avocado show the presence of a waxy layer on both the upper and lower surfaces of mature avocado leaves (Whiley et al, 1988). On the upper surface the wax appears as a continuous layer and there are no stomates. On the lower surface the wax layer is globular and stomates are present. Blanke and Lovatt (1993) describe the avocado leaf as having a dense outer wax cover in the form of rodlets on young leaves and dendritic (branching) crystals on old leaves including the guard cells (guard cells surround stomates). The flower petals and sepals in avocado have stomates on their lower surfaces and no wax layers on either surface, which might explain why floral sprays of boron might work. Based upon total leaf nitrogen concentration, Embleton and Jones (unpublished) in a replicated trial in California in the early 1950's found no response to leaf sprays of urea on mature 'Fuerte' avocado trees in the field. Up to three sprays a year were applied. Nevin et al (1990) reviewed urea foliar fertilisation of avocado and found only one study (Aziz et al., 1975) that reported positive results in terms of fruit yield. This trial by Aziz et al (1975) involved drenching sprays of significant amounts of urea four times a year (250 to 500 g of nitrogen per tree annually). It is unclear whether or not considerable amounts of the drenching spray reached the ground, nevertheless, the amounts applied were very high for foliar applications. No leaf analysis data was reported. Galindo-Tovar (1983) was able to increase leaf nitrogen concentrations in ‘Hass' avocado seedlings grown in a glasshouse with low concentrations of urea. However similar treatments on 3-year-old ‘Hass' in the field for each month during spring failed to increase leaf nitrogen in mature leaves sampled a week after spraying. The author cited evidence for crops other than avocado suggesting that urea can penetrate leaf surfaces when grown in a greenhouse, but when grown in the field under full sun, leaf surfaces are different and resist movement of nitrogen into the leaf. Klein & Zilkah (1986) reported substantial uptake of foliar urea-N when detached leaves of 'Fuerte' avocado were dipped in urea solutions. Zilkah et al (1987) reported the translocation of 15N from foliar-applied urea to vegetative and reproductive sinks of both 'Fuerte' and 'Hass' avocado. Despite the apparent response achieved by Aziz et al in Egypt, Klein & Zilkah, and Zilkah et al in Israel, attempts at the University of California to demonstrate significant uptake of nitrogen from foliar sprays have not been successful (Nevin et al., 1990). Research at the University of California, Riverside, provided evidence that the leaf nitrogen content of 'Hass' avocado was not increased by foliar application of urea at the same concentration that increased citrus leaf nitrogen content two-fold (Nevin et al., 1990). Maximum uptake of 14C-urea by 'Hass' avocado leaves was physiologically insignificant after 2 days. Over 96% of the 14C-urea applied was recovered from the leaf surface even after 5 days. Maximum uptake of 14C-urea by leaves of 'Gwen' and 'Fuerte' was less than 7%. 15N, 14C-urea and 65Zn are radioactive forms of nitrogen, urea and zinc respectively that are used to track their movement through the plant. Sing and McNeil (1992) conducted a study on an orchard with a history of potassium deficiency where high magnesium levels in the soil competed with potassium for uptake. 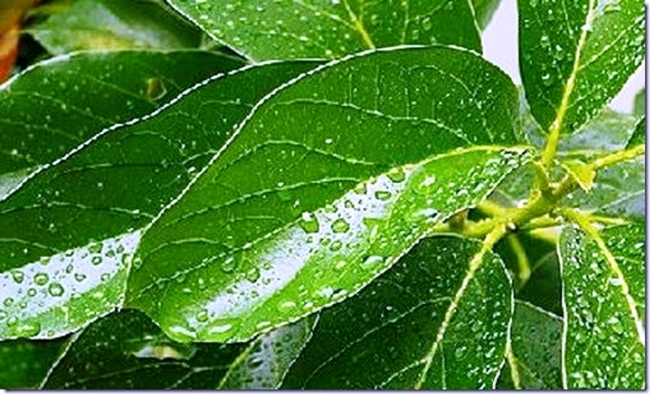 Foliar applications of 3.6% potassium nitrate were applied at half leaf expansion, full leaf expansion and one month after full leaf expansion. These foliar applications of potassium nitrate were effective in increasing the potassium level in the leaves of 'Hass' avocado trees, however two to three foliar applications per year were required to achieve the same result as one application of potassium sulphate (banded) to the soil once every 2 to 3 years. Accounting for labour and material costs the foliar sprays of potassium nitrate were estimated to be more expensive than soil applied potassium sulphate applied every three years. The foliar sprays also affected the levels of other nutrients in the leaf, some negatively. Calcium is receiving attention as an element in avocado fruit associated with better quality and longer shelf life. Several different calcium products were tested during the 1980's as foliar sprays in South Africa in an attempt to raise fruit calcium levels but none were found to be effective. Veldman (1983) reported that the treatment of avocado trees with one, three and six calcium nitrate sprays did not successfully control pulp spot in avocado fruit and there was no increase in fruit calcium levels on sprayed treatments. Whiley et al (1997) report that calcium foliar sprays during fruit growth have little effect on internal concentrations in most fruit due to poor absorption by fruit, and lack of translocation within the tree. Some benefits have been reported from foliar application of boron if applied at flowering. Timing is important because it appears that absorption takes place through flower structures and not leaves. Jayanath and Lovatt (1995) reported on results of four bloom studies (two glasshouse and two field experiments) which demonstrated the efficacy of applying boron or urea sprays to 'Hass' avocado inflorescences during early expansion (cauliflower stage) but prior to full panicle expansion and anthesis. Anatomical analysis of the flowers provided evidence that the boron prebloom spray increased the number of pollen tubes that reached the ovule and also increased ovule viability, but to a lesser degree than urea. The urea prebloom spray increased ovule viability compared to boron-treated or untreated flowers. Urea also increased the number of pollen tubes that reached the ovule, but to a lesser degree than boron. However, combining boron and urea resulted in a negative effect even when the urea was applied 8 days after the boron. Lovatt (unpublished) provided an update on this work at the World Avocado Congress in 1999, after 3 years of field trials the only treatment to have a positive effect on pollination was the boron in Year 2, the most likely reason why it didn't work in other years was thought to be low temperatures. There were only hardened leaves present at the time of foliar applications suggesting that uptake was through flower parts. Whiley et al (1996) report that despite an increase in fruit set with foliar sprays of boron during flowering there has been no convincing evidence that showed increased final yield. 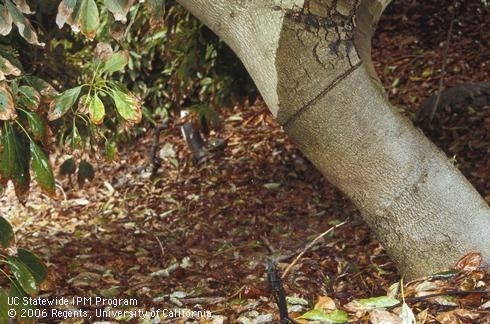 Root growth has a requirement for boron and in deficient trees it is unlikely that sufficient nutrient from foliar applications would be translocated to the roots. Foliar applications have the advantage that specific organs can be targeted to enhance their boron concentrations, but with the disadvantage that insufficient boron can be absorbed through leaves to mediate chronic deficiency in trees. Soil applications have been shown to dramatically improve the health of boron deficient trees. Mans (1996) experimented with ‘Hass' trees that had leaf levels of nitrogen and boron below the accepted norms (N was 1.71% and B was 23ppm). The aim of this trial was to see if supplying nutrients directly on the flowers could increase the yield of ‘Hass' trees growing in a cool environment. Mans (1996) found that if a multi-nutrient spray that included nitrogen and boron was applied as the first flowers started to open then he could increase yield and distribution of fruit size. The stage of flowering when spraying takes place was very important. Sprays that were applied pre-bloom, at fruitset or when fruitlets were present were not effective. Kadman and Lahav (1971-1972) reported that the only means to control iron chlorosis in already established avocado orchards is soil application of iron chelates since applications of various iron compounds by foliar sprays have not been successful on a commercial scale. 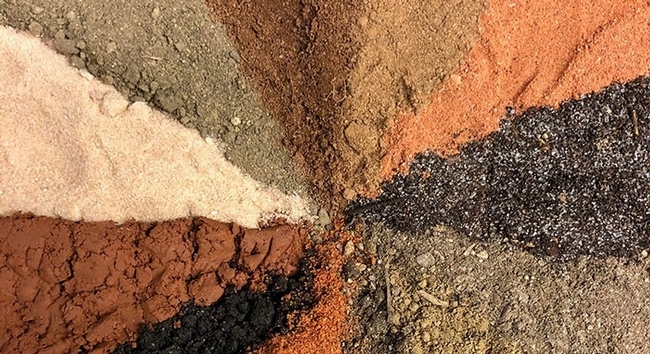 Gregoriou et al (1983) found that the quickest and most successful treatment of trees suffering from iron chlorosis on calcareous soils was obtained by incorporating Sequestrene 138 Fe-EDDHA in the soil. Kadman and Cohen (1977) found that avocado trees have difficulties in absorbing mineral elements through their foliage. In spite of this, spraying of apparently zinc-deficient orchards was rather common in California and some other countries. In Israel, some growers spray their orchards, but as experiments have shown, no apparent improvement occurs in leaves or fruits following such treatment. The results presented in this paper indicate that the penetration of zinc through the leaves is so slight that there is practically no benefit through supplying it by foliar sprays. • foliar applications of zinc sulphate, zinc oxide, or zinc metalosate. Among the three soil and irrigation treatments, zinc sulphate applied at 3.2 kg per tree either as a quarterly irrigation or annually as a soil application was the most effective and increased leaf tissue zinc concentrations to 75 and 90 mg/kg respectively. Experiments with 65Zn applied to leaves of greenhouse seedlings, showed that less than 1% of zinc applied as zinc sulphate or zinc metalosate was actually taken up by the leaf tissue. There was also little translocation of zinc into leaf tissue adjacent to the application spots or into the leaves above or below the treated leaves. Given these problems with foliar zinc, Crowley et al (1996) suggest that fertilisation using soil or irrigation applied zinc sulphate may provide the most reliable method for correction of zinc deficiency in avocado on calcareous soils. Whiley and Pegg (1990) report that foliar applications of zinc have been found to be highly ineffective in Queensland orchards. Price (1990) reports that zinc can be absorbed through the leaves (from foliar sprays, e.g. zinc sulfate, zinc chelate) but that insufficient zinc can be absorbed in this manner to meet the plants requirements, especially in avocados. Since zinc is required at the growing points of new roots and shoots, it is essential that most zinc be taken up by the roots. If leaf applied nutrient sprays in avocado give inconsistent or nil effects why do foliar sprays of phosphorous acid work for the control of root rot? The amount of phosphorous acid uptake required for root rot control is small but even so, several applications per year are required to be effective and the canopy must be dense and healthy. The phosphonate concentration required in the roots for effective root rot control is in the order of 30 mg/kg. To achieve this level either three to four sprays of 0.5% phosphorous acid per year are required at strategic times (Leonardi et al., 2000) or alternatively six or more sprays of 0.16% phosphorous acid per year must be applied. Another factor contributing to the effectiveness of leaf applied phosphorous acid is that, unlike many nutrients, it is extremely mobile in the plant. Borys (1986) reports the dry matter distribution of roots to shoots in avocado seedlings average 26% and 74% respectively. Using these figures and some critical nutrient and fungicide levels in avocado we can get some perspective on the relative quantities required. In a tree consisting of say 100 kg of dry matter, about 26 kg would be in the roots and 74 kg in the shoots. This tree with a phosphonate root level of 30 mg/kg would contain a total of about 0.8 g phosphonate in the roots. With the optimal leaf levels of 50 mg/kg of boron and 2.5% of nitrogen, the tree would contain about 4 g and 1850 g of boron and nitrogen respectively in the canopy alone. It can be seen from these relative amounts that the fungicide required is substantially less than the nutrients. Apart from well-timed boron applications at flowering in situations where leaf boron levels are deficient, there is no clear evidence to support the use of foliar nutrient sprays in avocado to correct nutrient deficiencies or to supply nutrients for growth. 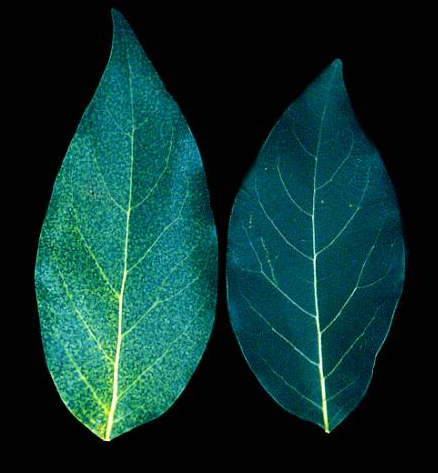 Occasionally a foliar nutrient spray may succeed in alleviating leaf deficiency symptoms, however this type of application will not provide the tree's longer-term requirements for this nutrient which should be addressed through soil applications. I would like to thank Drs Chris Searle and Tony Whiley and Mr Garry Fullelove of the Queensland Horticulture Institute for their assistance in compiling this article. The literature search was conducted using the AVOINFO avocado reference database. Aziz, A.B.A., Desouki, I., El-Tanahy, M.M., Abou-Aziz, A.B. and Tanahy, M.M., El 1975. Effect of nitrogen fertilization on yield and fruit oil content of avocado trees. Scientia Horticulturae, 3 (1): 89-94. Blanke, M.M. and Lovatt, C.J. 1993. Anatomy and transpiration of the avocado inflorescence. Annals of Botany, 71 (6): 543-547. Borys, M.W. 1986. Root/shoot relation and some root characteristics in seedlings of avocado and Chinini. California Avocado Society Yearbook 70: 175-198. Crowley, D.E., Smith, W., Faber, B. and Manthey, J.A. 1996. Zinc fertilization of avocado trees. HortScience 31 (2): 224-229. Galindo-Tovar, G.E. 1983. Effects of urea spray concentration and surfactants on avocados. M.S. Thesis, University of California, Riverside, USA. September. Gregoriou, C., Papademetriou, M. and Christofides, L. 1983. Use of chelates for correcting iron chlorosis in avocados growing in calcareous soil in Cyprus. California Avocado Society Yearbook 67: 115-122. Jayanath, I. and Lovatt, C.J. 1995. Efficacy studies on prebloom canopy applications of boron and/or urea to 'Hass' avocados in California. World Avocado Congress III, Proceedings: 181-184. Kadman, A., and Lahav, E. 1971-1972. Experiments with various treatments to cure chlorotic avocado trees. California Avocado Society Yearbook. 55:176-178. Kadman, A. and Cohen, A. 1977. Experiments with zinc applications to avocado trees. California Avocado Society Yearbook, 61: 81-85. Klein, I. & Zilkah, S. 1986. Urea retention and uptake by avocado and apple trees. Plant Nutr. 9:1415-1525. Leonardi, J., Whiley, A.W., Langdon, P.W., Pegg, K.G. and Cheyne, J. 2000. Progress on the use of foliar applications of phosphonate for the control of phytophthora root rot in avocados. Mans, C.C. 1996. Effect of foliar feeding of ‘Hass' at various stages of flowering. South African Avocado Growers' Association Yearbook, 19: 31-32. Nevin, J.M., Lovatt, C.J. and Embleton, T.W. 1990. Problems with urea-N foliar fertilization of avocado. Acta Horticulturae 275: 535-541. International Symposium on the Culture of Subtropical and Tropical Fruits and Crops. Vol. II. (J.C. Robinson, ed. ), International Society for Horticultural Science. Wageningen, Netherlands. Price, G. 1990. Thinking about zincing your trees? Talking Avocados, Third Edition, Aug/Sept, p.5. Sing, J.L. and McNeil, R.J., 1992. The effectiveness of foliar potassium nitrate sprays on the 'Hass' avocado (Persea americana Mill. ), World Avocado Congress II, Proceedings: "The Shape of Things to Come" (Lovatt, C.J. ed.) 1: 337-342. Veldman, G. 1983. Calcium nitrate sprays on avocados at Westfalia Estate with the objective to reduce pulpspot. South African Avocado Growers' Association Yearbook, 6: 64-65. Whiley, A.W., Chapman, K.R. and Saranah, J.B. 1988. Water loss by floral structures of avocado (Persea americana cv. Fuerte) during flowering. Australian Journal of Agricultural Research, 39 (3): 457-467. Whiley, A.W., and Pegg, K.G.1990. Correction of micro-nutrient deficiencies and control of Phytophthora root rot in avocado. Talking Avocados, Second Edition, May/June, p. 11. Whiley, A.W., Smith, T.E., Saranah, J.B. and Wolstenholme, B.N. 1996. Boron nutrition of avocados, Talking Avocados, 7 (2): 12-15. Whiley, A.W., Hofman, P.J and Coates, L.M. 1997. From seed to tray - some field practices to improve avocado fruit quality. Proceedings of the Australian Avocado Growers' Federation and the New Zealand Avocado Growers' Association Conference '97, 'Searching for Quality'. Rotorua, New Zealand, pp. 83-97. Zilkah, S., Klein, I., Feigenbaum, S. and Weinbaum, S.A. 1987. Translocation of foliar-applied urea 15N to reproductive and vegetative sinks of avocado and its effect on initial fruit set. J. Amer. Soc. Hort. Sci. 112:1061-1065. MISSION VIEJO, Calif. — Tufts University has released results of a study linking eating avocados to helping improve cognitive brain function in older adults, news especially relevant to Hispanics who have been found to have the longest life expectancy rate in the U.S.1 Published in the journal Nutrients and supported by the USDA and the Hass Avocado Board, the research tracked how 40 healthy adults ages 50 and over who ate one fresh avocado a day for six months experienced a 25% increase in lutein levels in their eyes and significantly improved working memory and problem-solving skills. Lutein is a type of carotenoid antioxidant, or pigment, commonly found in fruits and vegetables already widely accepted to have a role in preserving eye health and now increasingly thought to have a positive impact on brain health as well. As study participants incorporated one medium avocado into their daily diet, researchers monitored gradual growth in the amount of lutein in their eyes and progressive improvement in cognition skills as measured by tests designed to evaluate memory, processing speed and attention levels. In contrast, the control group which did not eat avocados experienced fewer improvements in cognitive health during the study period. To view the abstract, visit here. This study is part of ongoing research that is continually unlocking the unique benefits of avocados to human health. Discover delicious inspiration for different ways to prepare and enjoy healthy avocados in Spanish at SaboreaUnoHoy.com and in English at LoveOneToday.com. Lutein is selectively incorporated into the macula and brain. Lutein levels in the macula (macular pigment; MP) and the brain are related to better cognition. MP density (MPD) is a biomarker of brain lutein. Avocados are a bioavailable source of lutein. This study tests the effects of the intake of avocado on cognition. This was a six-month, randomized, controlled trial. Healthy subjects consumed one avocado (n = 20, 0.5 mg/day lutein, AV) vs. one potato or one cup of chickpeas (n = 20, 0 mg/day lutein, C). Serum lutein, MPD, and cognition were assessed at zero, three, and six months. Primary analyses were conducted according to intent-to-treat principles, with repeated-measures analysis. At six months, AV increased serum lutein levels by 25% from baseline (p = 0.001). C increased by 15% (p = 0.030). At six months, there was an increase in MPD from baseline in AV (p = 0.001) and no increase in C. For both groups, there was an improvement in memory and spatial working memory (p = 0.001; p = 0.032, respectively). For AV only there was improved sustained attention (p = 0.033), and the MPD increase was related to improved working memory and efficiency in approaching a problem (p = 0.036). Dietary recommendations including avocados may be an effective strategy for cognitive health.